Large-scale protests following the release of the national budget — first in Haiti in September 2017 and then in Iran in January 2018 — are a stark reminder that the decisions on how public funds are raised and spent, reflected in national budgets, have a direct bearing on the lives of ordinary people. In Haiti people took to the streets to protest tax increases that had not been previewed with the public or subjected to a national debate. In Iran the release of the 2018 budget proposal contributed to nationwide demonstrations as people responded to news that fuel subsidies and cash transfers to the poor had been cut while spending on religious institutions and defense spending on regional conflicts was increased. The publication of budget documents — even those with sensitive or contested information — does not automatically result in public unrest. In fact, budgets are routinely published in countries around the world on an annual basis. While the documents and the process of publishing them are often imperfect, this practice demonstrates that budget information published in a thoughtful and deliberate manner alongside opportunities for the public to participate in the decision-making process have the potential to allow for citizens to constructively engage their government on the trade-offs captured in the annual budget. International Budget Partnership (IBP) research increasingly shows that transparent and inclusive budgeting often results in public taxation and spending that better align with public priorities, as well as in more effective implementation and service delivery. 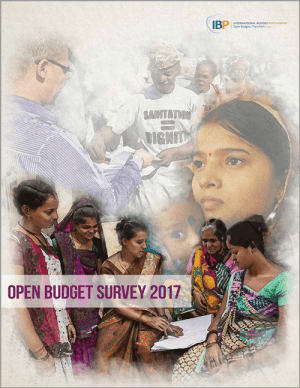 On 30 January 2018 IBP will release the Open Budget Survey 2017 — the latest round of the world’s only independent and comparative assessment of budget transparency, citizen participation, and independent oversight institutions in the budgeting process. The Open Budget Survey measures whether governments in 115 countries across the world provide citizens the information they need about public finances and how it affects their lives. In addition to basic information on revenues, expenditure, and debt, citizens — like those in Haiti and Iran —need detailed information on taxes and programs that benefit the most impoverished. Beyond knowing how the government plans to raise funds and allocate them across priority sectors, citizens also need to know how the budgeted spending is going to be managed on the ground and what results the proposed spending is intended to achieve. Together, if presented in a timely manner and comprehensively, this information can allow the public to assess in more detail what the government is proposing to do with its money, and monitor whether that actually happens. As part of the Open Budget Survey 2017, IBP will also be releasing the full Open Budget Index, which rates the level of budget transparency in each survey country by assigning it a score between 0 and 100. The survey also includes specific recommendations to increase the level of budget transparency in each country assessed to ensure that government budgets include the information citizens need to hold their governments to account on the use of public funds. If you, like the citizens of Haiti and Iran, care about the government’s plans to address urgent problems such as poverty, healthcare, and education — and how the government intends to finance those policies and programs — then you should care about the usefulness of information in your national budget and the Open Budget Survey results. Be sure to see them at www.openbudgetsurvey.org on 30 January 2018! 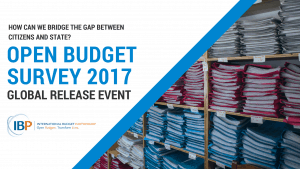 Join IBP for the Global Release Of The Open Budget Survey 2017! A new round of the Open Budget Survey is set to be released in a little over a week covering 115 countries, including 13 new countries some of which are from francophone Africa. Join us for the global release on January 31, 2018 in Washington, D.C. and February 6, 2018 in London to hear the new results and its implication from a panel of experts.